02.3.19–[Livingston Hall]–This year is Super Bowl 53! Come celebrate the biggest day in football with your friends at a giant viewing party right on campus! 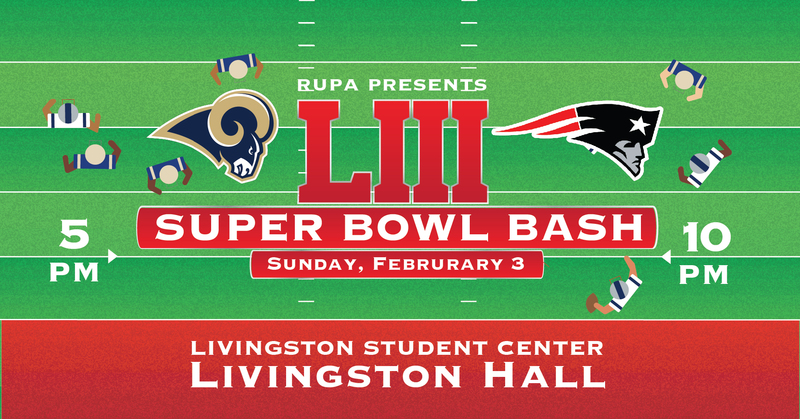 February 3rd at 5:00 PM at the Livingston Student Center in Livingston Hall, RUPA will be kicking off the Super Bowl in style! We will be having FREE food and drinks, prizes throughout the night, and the Super Bowl displayed on the big screen for an event you won’t forget. This event will be cosponsored with Residence Life.